29 enchanting tales present God in a variety of multicultural, non-sexist ways - as a transcendent mystery, a spiritual force, peace and silence, the mother and father of life, light and darkness and more. Mary Ann Moore spent more than 40 years as a religious educator. She has written several other books about God. Moore lives in Prescott, Arizona. Once upon a time God said, “I’m bored because I don’t have anything to do. I want to play with my friends.” And because God is God, as soon as the words were spoken, God’s friends were there. When God saw them all gathered, God said, “I’ve been bored because I haven’t had anything to do. Let’s play something.”“Good idea,” said God’s friends. 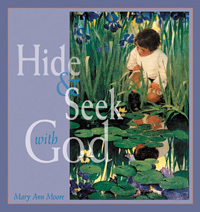 “What shall we play?” God thought for a minute and then said, “I know, let’s play hide-and-seek!” The friends all said, “Yay!” They knew that hide-and-seek with God was always exciting and different because God was the one who hid and God always thought of wonderful places to hide. God’s friends closed their eyes tight and counted to ten. When they opened their eyes, God wasn’t there anymore. So they all went off to look for God.